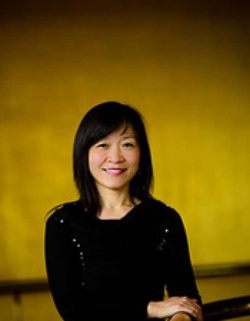 Violinist Wen Yuan Gu joined the Utah Symphony in 1998, became Associate Principal Second Violin in 1999, and serves as Acting Principal Second Violin. She is a native of China, where as a child she studied at the Central Conservatory of Music in Beijing and performed for Isaac Stern during his famous visit in 1979. Ms. Gu moved to the United States to study at North Carolina School of the Arts and then to Pittsburgh to study with concertmaster Andres Cardenes (Pittsburgh Symphony) and to obtain her M.A. degree at Carnegie Mellon University. Between 1994 and 1998, She played with the orchestras of the Houston Ballet and Houston Grand Opera. She has won numerous competitions, including fourth place in the Chinese National Competition in 1985 and first prize in the Hennessy Cognac Performing Arts Competition in New York in 1992. Her recent recitals include a 2006 performance in Libby Gardner Hall at the University of Utah, a 2006 performance in Zhaoqing, China, and a 2007 performance at Beijing University. During the 2006-07 symphony season, she spent a sabbatical in Beijing to practice and study Chinese music and musical styles.